How often have you faced issues in effectively communicating a well formulated strategy to the right stakeholders? Understanding organizations’ strategic plan by all who are involved in the execution is as important as optimally creating it. A well-orchestrated process must be in place to facilitate better understanding of the strategy and the specific roles to be played by different teams. Unless the goals are understood clearly, chances are that you end up having a big gap between intended strategy and the realized strategy. So, how do we ensure that you have the right plan and process in place for a successful communication of strategy? It is a well-known fact that majority of strategies fail, a key contributor being poorly designed and executed communication plan. One should be committing adequate resources and time to develop a sound method to overcome this. Develop your communication strategy. Developing a solid communication strategy is not easy, you improve as you learn more from the feedback you get on how well the target groups received and understood the message, as it was intended. This is a continual process and there is no such thing as achieving 100% perfection. Ensure that this two-way process is effectively managed. Set your achievable objectives at the onset. Be clear on what you want to achieve in measurable terms from this process. It could be increased collaboration based on a single source of truth, understood clearly by all target groups. Better execution of strategy, focused on end goals. Increased employee engagement resulting in positive gains all around. 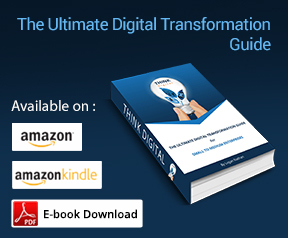 An agile and focused communication culture which grows with the transformation of your business landscape. Improved skill sets in the use of communication tools and more. Communication team: You need to have a team comprising of communication experts (internal or external) and members from strategy formulation group to develop and deliver the communication content. Know your target groups. Identify the target groups who will be receiving the message, both internal and external (customers, suppliers and community), so that precise and focused communication is made possible for each target group. Substantial efforts will have to be put in to gain cross-cultural intelligence which will help in better communication. The synergy of generations in the workplace plays a key role in the success of any business. Successful communication process will identify these, particularly millennials (expected to be 70% of the global workforce by 2020), for effective delivery of targeted content. 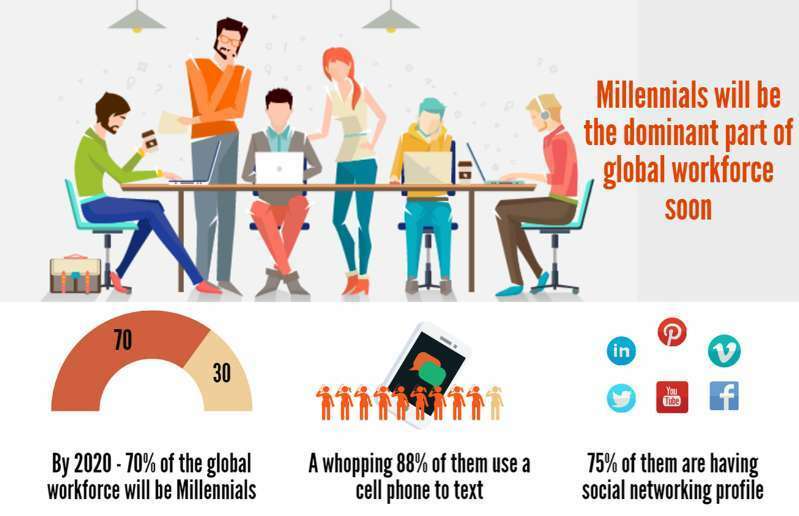 This infographics gives few of the facts related millennials and why they should a specific target group. May be it is not as difficult as it seems, communicating with millennials – Millennials in the Workplace Training Video. A more serious and recent finding on how millennials are shaping their future – Millennial Playbook. The Budget: It is important that you allocate adequate budget for content creation and distribution like resources who manage this process, external consultancy expertise and for other related activities. Also you should be having in place better communication tools like Slack which will improve the effectiveness of collaboration at workplace. You can train and develop communication ninjas, for consistent delivery of the message. The message: The gist of the strategy, story about what is it that you want to achieve, how you are going to do it and why you want reach those goals, in a simple way, to give target groups the overall picture. You will also communicate clearly the strategic objectives which relates to their functional areas, initiatives that will help in realizing the strategic intent, risks that need to be managed on the way and the measures which will reflect status of the strategy. If cross-functional teams are involved in managing themes (objectives with causal links clubbed for coherence) then the roles and interconnectivity will have to be detailed specifically. With a multi-cultural and multi-linguist workforce from different generations, a ‘one size fits all’ approach for communication will not work. Using more of visuals and a story telling style, which is conversational to elicit right feedback, would be very effective. The ultimate aim is to get everyone on the same page on understanding of the strategy. The Language: Use the languages which are most commonly spoken amongst the target groups to get the message across effectively. Keep it as simple as possible. 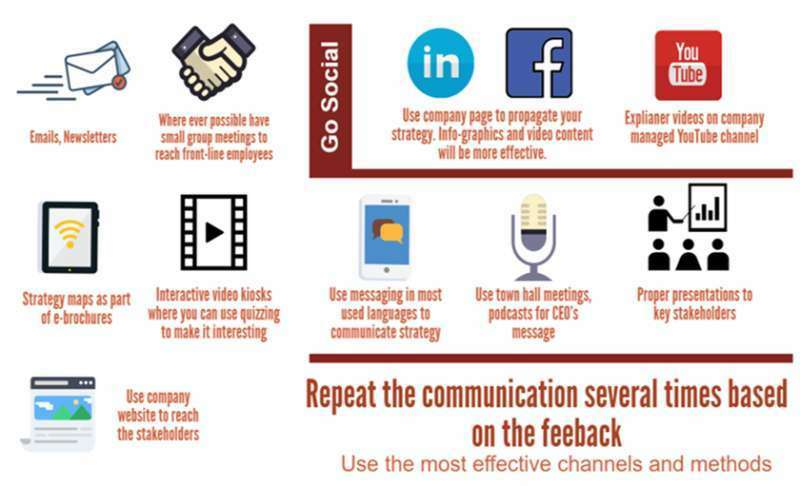 Communicate using different channels: Traditional methods like e-mails, bulletin boards, newsletters, team meetings, video with CEO message, strategy maps, presentations using explainer videos, screensavers, and any other channel which best suits your communication needs can be used to get the message across. Also look at messaging and social media while targeting millennials. What’s in it for me (WIIFM): Engaged employees play a key role in the execution process. They should be able to respond to change positively. It will be highly beneficial to communicate how employees are going to be benefited as the organization makes progress towards realizing the strategy and reaching the set goals successfully. Communicate with authority: Strategy must be backed by top management for everyone else to put their heart into it. The voice of CEO will have to be heard clear and loud by all involved. Even executives should put their signature on the content which gets communicated downwards. Schedule the communication plan: Various activities related to strategy communication will have to be sequenced and bound to a time plan. Activities like completion of key tasks, frequency of communication, and use of different channels, response and feedback will have to be closely monitored. Learn from the process and improve as you communicate further. Ensure a feedback loop. It is better to ask receivers of the content to provide feedback as what they have understood and how it could be made better. Respond to the feedbacks promptly to encourage better inputs. Refine the content and methods of communication while you launch the next round of activities. Communicate and celebrate short wins. Positive contributions which drive the strategy forward towards your vision have to be acknowledged and celebrated together. Personal pride in seeing the things done right and being recognized for it, will definitely make employees emotionally committed to put in that extra effort which will make a difference to the final outcome. You create the right atmosphere for them to thrive. Conduct communication audit. You must use different methods to assess the impact of your communication content and methods. Using anonymous surveys like Survey Monkey, without overloading them with too many questions and keeping them open ended to elicit better response from the target group. Interactive video kiosks which will ask specific questions about strategy, objectives, goals, etc. can help you gauge the understanding gained by the workforce. Analyze the findings and link them to objectives set at the beginning to know where you stand. Set the course corrections and repeat the process at a desired time interval. All said and done, the below quote could still be relevant for your organization. Have a look at this video where Robert S. Kaplan few tips on successful use of conventional methods – Communicating Strategy with the Balanced Scorecard.